Last year, hackers discovered a handful of Pokémon hidden inside the code of Pokémon X & Y. The Pokémon were called Diancie, Volcanion, and Hoopa. They looked cool, but, unfortunately, the series' developers at Game Freak didn't officially release any of them at the time. All the average player could do was look at screenshots of these mysterious new Pokémon in wonder. Now, over a year later, things have changed a bit. Diancie, one of the Pokémon found inside the code of X & Y, not only turned out to be real, but ended up having an entire movie dedicated to it. Heck, some players now even have Diancie in their games, thanks to recent Pokémon events held by retailers like Gamestop. That's one Pokémon down. What of the other two? Volcanion still hasn't been released—though you can still read about its Pokedex entry and the moves it can learn. Hoopa, on the other hand, is a Pokémon whose mystery has only grown with the release of Pokémon Omega Ruby and Alpha Sapphire. Here's what we know. 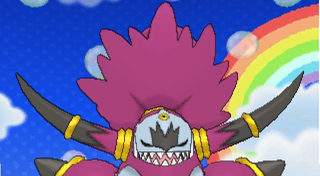 While Hoopa hasn't been officially released by Game Freak, hackers managed to get the Pokémon anyway. One person told us that they had to "patch the game's data on the fly" in order to access unreleased Pokémon like Hoopa. That's how we know things like: Hoopa is a psychic and ghost type, and it has an ability called "magician." Back when the demo for Omega Ruby and Alpha Sapphire was released, a hacking team called "Project Pokemon" discovered more curious hidden data about Hoopa. Inside the demo was a sprite that nobody had seen before, which looked a hell of a lot like Hoopa, too—only way more menacing. Basically, if the player goes into a Pokémon mart while carrying a Hoopa, a new Pokémon mart employee will show up in the corner of the building. If you talk to him, he'll tell you a "scary story" about an old guy who duped the Pokémon mart employee into trading mart goods for an item that seemed useless. Thinking that the item is just a valueless empty old bottle, he gives it to the player. The item is ominously called "Prison Bottle," and the man who gave it to the Pokémon mart employee kept talking about how its supposed to make Hoopa "unbound" for three days. To the Pokémon mart employee, the bit about Hoopa probably seemed like nonsense, just a rant. The guy probably doesn't even know that a Pokémon called Hoopa exists. But players who have been following the Hoopa story know that it's supposed to have some sort of different form thanks to hackers who looked at the code of the Omega Ruby and Alpha Sapphire demos. And sure enough, if you use the bottle on Hoopa, it transforms into this thing, which is Hoopa Unbound. Looks kind of scary, no? Especially when compared to its original form. Furthering this feeling is the game's description of the ominously-named Prison Bottle. To quote, "A bottle believed to have been used to seal away the power of a certain Pokémon long, long ago." "We must consider that many of the legendary Pokémon you find around Omega Ruby and Alpha Sapphire appear in mysterious locations, such as strange islands. Furthermore, you always have to go through an actual hoop to get to the legendary Pokémon. "Hoopa is supposed to be a mythical Pokémon with rings, which can transport things as big as entire islands. How many rings does Hoopa have, according to the leaked text from months ago? Three. How many mysterious locations appear on your map every day, each with portals to legendary Pokémon? Three. Lore-wise, the fact that three legendaries from entirely different games appear every day inside of portals located in mysterious islands in Omega Ruby and Alpha Sapphire could be explained by the existence of another legendary, such as Hoopa." Obviously, a lot of that is speculation—and will remain speculation until Game Freak releases Hoopa, should they ever do that. But what makes this so interesting isn't just that players are leaking what appear to be legendary Pokémon sometimes up to a year in advance, or that it's a Pokémon that only hackers (and the people who trade with them) can get. It's that this Pokémon in particular seems so damn cool. The evil genie-like design is great, and I like small touches that the Pokémon has, like the fact that it doesn't completely fit on your screen, should you bring it up on Pokémon Amie (the feature that lets you pet your Pokémon). And that evil smile! It's great. I don't think I'm the only one that feels this way, judging from all the Hoopa fan-art floating around sites like Tumblr. And if the thing about its portal rings turns out to be true, one can only guess what sort of crazy story Game Freak is going to come up with that uses that stuff, once they officially put Hoopa in the game. After the Delta Episode, which toys with the idea of multiple Pokémon timelines and different dimensions, it looks like the Pokémon games could be taking a wild turn. I'm guessing that Hoopa's abilities, which allow it to transport entire islands across space and time, will feed into a storyline about multiple dimensions. And I'm guessing that, based on what we know about Hoopa Unbound, things might get a little dark. But who knows! Even if Hoopa ends up making it into the Pokémon games someday, everything we know about it might change between now and release. For now, all we know that Hoopa is hiding in the code of both Pokémon X & Y and Pokémon Omega Ruby and Alpha Sapphire. We can't have it yet, and the only means of getting Hoopa are 'illicit'—both of which only make me want it more. Correction: this article originally said that players discovered Hoopa through Software such as Powersave. In actuality, hackers used other methods to access Hoopa.